The discussion on path “repair” in the Mournes and contributions by mountainviewers are most interesting. I am delighted the subject continues to engage us – as it should. For example mcrtchly’s dogged research has thrown up unsettling issues and suspicions, to the effect that he entertains us lobbying the Environment Agency. Were anyone interested, time-healthy or beaurocracy-savvy enough to take this on, including the Crtch himself, I for one should be most interested to read the findings. Yesterday, we included the traditional ascent of Slieve Donard from the Glen River. If ever there were evidence of misdirected enthusiasm for path repair, here it is. 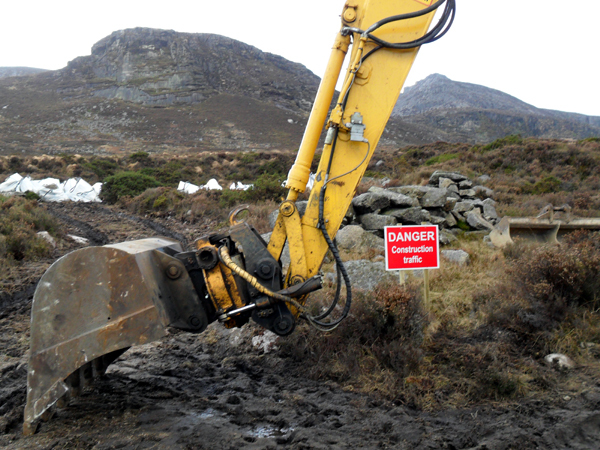 Now, I am no supporter of the hillwalker/erosion debate contending that whatever “damage” we do in the great scheme of things is so environmentally insignificant as to warrant no action at all – certainly not expensive action - but you do wonder if the initiators of path repair on Donard aren’t themselves just a tad shame-faced. In terms of the very currency cast by themselves, this exercise has been an unmitigated disaster. Traditionally walkers on this route would have walked up the north side of the wall cutting one track into the hill. With the introduction of unwanted, unnecessary and expensive granite steps, the hill is now scarred, pock-marked and (if you want) eroded beyond (if you also want) repair – because walkers choose the hill rather than these unwalkable steps. From one clean track to half a dozen fractured zigzags. If this is the standard of thinking that fuels the efforts now beneath Binnian, God spare us from it. A dull day was made all the more leaden by the sound of a construction helicopter abetting building work beneath Perchy Bysshe. Speaking to hillwalkers on the subject, I hear no support for this enterprise at all.